Kodaline - Live in Singapore 2019! No admission for infant in arms and children below 7 years old. Children 7 years and above must purchase a ticket for entry. 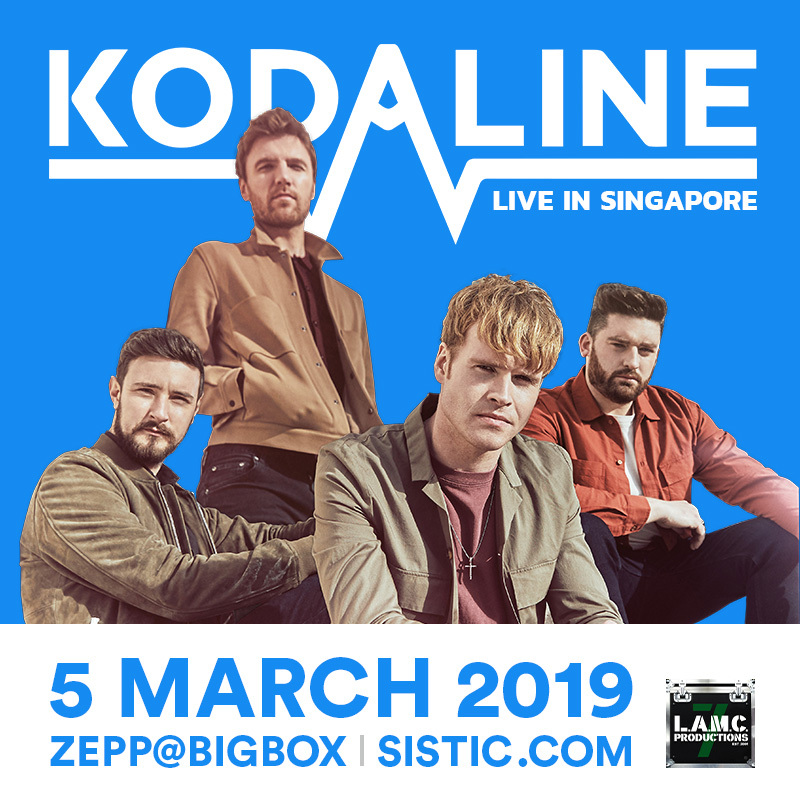 LAMC Productions is excited to announce that Ireland-based, UK Platinum-selling, modern rock quartet, KODALINE, will make their highly anticipated return to Singapore, on 5 March, 2019, at ZEPP@BIGBOX. Kodaline released their brand new album, Politics of Living, on 28 Sep 2018, to rave reviews and are ready to embark their upcoming world tour! Dublin based rockers, Kodaline, specialize in soaring, radio-ready guitar rock that's drawn comparisons to Coldplay, Keane, U2, and Oasis. Kodaline got their start when childhood friends Steve Garrigan and Mark Prendergast brought their guitars to a summer camp in Dublin, spending the days penning songs together. Originally performing under the name 21 Demands, the duo added Jason Boland (bass guitar) and Vinny May (drums) to the lineup, forming Kodaline in 2011. At the end of 2012, the band was shortlisted for the BBC's Sound of 2013, but was beaten to the top spot by HAIM. Kodaline released their debut album, In a Perfect World, in June 2013, which was preceded by the singles High Hopes and Love Like This. The album was a major success in Ireland, going platinum twice and has sold over a million copies worldwide, imprinting itself on the nation's consciousness with streaming figures well into the 100s of millions. On Vevo, the band's videos have had over 200 million views, and they have sold over a million singles. Kodaline's second album, Coming Up for Air, followed in early 2015. The album peaked at number four on the U.K. charts and spawned the singles "The One" and "Honest." Since then, they've played massive sold-out shows and a number of festivals worldwide, earning a cult following in their short time together. Their music has also been featured in several television, film and ad placements including Chicago PD (NBC), Grey's Anatomy (ABC), Modern Family (ABC), So You Think You Can Dance (FOX) American Idol (ABC) and so much more. Notably, "All I Want" was released as part of the soundtrack for The Fault in Our Stars, as well as used in the film. On Politics of Living, Kodaline teamed up with some of the hottest production and writing talent imaginable including hitmaker supreme Steve Mac (Ed Sheeran, Liam Payne), pop guru Johnny Coffer (Rag'N'Bone Man, Beyoncé), Jonas Jeberg (Dizzee Rascal, Kylie Minogue), Stephen Harris (Miles Kane, Kaiser Chiefs) as well as long-time collaborator Johnny McDaid (P!NK). The album is a delightful treat and surrounds big choruses with digital rhythms, glimmering piano riffs, and synths. Kodaline are - singer Steve Garrigan, guitarist Mark Prendergast, bassist Jason Boland and drummer Vinny May. The Runaway Company: "Wilderness" Open Call Not In My Lifetime?